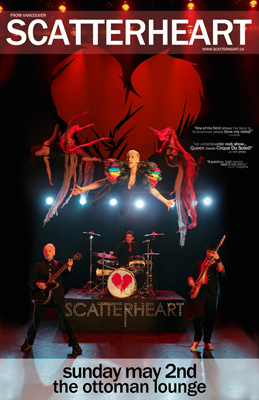 Scatterheart will be back in Medicine Hat rocking the Ottoman Lounge Sunday, May 2nd (tomorrow) at 8pm. $10 cover at the door. Don’t miss this show, it’s going to be amazing! Scatterheart isn’t afraid to take chances. The band loves the unexpected and their audience practically demands it now. It’s all about handstands during guitar solos, bubbles instead of pyro, and feathers instead of jeans and t-shirts. It’s powerful Love Rock delivered in a classy way, and by the end of the show the crowd screams… “SCATTERHEART LOVES ME”. Well, of course they do. This entry was posted on Saturday, May 1st, 2010 at 2:44 PM and is filed under Music Events, Rock Music, The Ottoman Lounge. You can follow any responses to this entry through the RSS 2.0 feed. You can leave a response, or trackback from your own site.